Designed with distinction and flair. This gorgeous home combines sophistication with casual elegance. 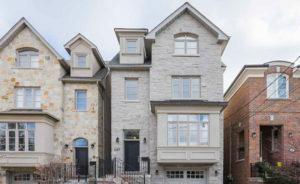 This wonderful townhouse is situated in the coveted Allenby School area and within easy walking distance to the shops, bistros and subway at Yonge and Eglinton. This home boasts of 4 generous bedrooms 5 baths, open concept kitchen, breakfast and family room with walkout to deck. The lower level has a recreation room with gas fireplace, walkout to sunny garden backing onto park, there is direct access to a single garage.